NEW NAIL ART TREND – Celebrities using Stiletto Fingernails! Are you tired of the squared down nail shape and want to update to something new? If so, check out the new celebrity favorite, the pointy shaped nails! The newest nail art trend sported by the hottest Hollywood Divas (and spotted by: BecomeGoreous.com) is the stiletto/pointy shaped nails trend which is characterized by a lovely pointy shape that elongate fingers. Although the shape of your nails might seem like an unimportant thing, it is not, as nail shape can transform the aspect of your hands instantly and completely. Let’s take a look at some recent impressions of the hands of various celebrities – including: Lady Gaga, Beyonce Knowles, Rihanna & Fergie long pointy fingernails. Faces on fingernails – a fetish fixation of female celebrities? Last month Marc Ecko wrote a column titled ‘fetish friday’ which described quite a few celebrity women showing their long, crazy fingernails. Quite a few have faces on their fingernails! 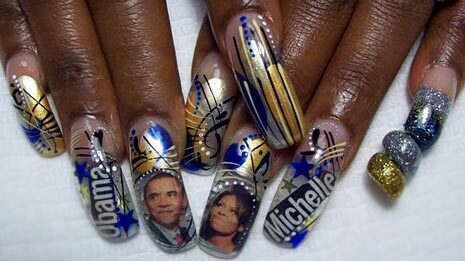 And recently popstar Rhianna was spotted with Barack Obama on her pinky fingernail. Faces on fingernails – a new fingernail trend? Recent developments in fashion indicate: fingernail trends come and go. While in the 70’s long fingernails became very popular – as a sign that the person belongs to the ‘leisure class’ – with the rising popularity of artificial nails that trend disappeared quickly. Will ‘faces on fingernails’ become a new trend? Recently popstar Rhianna was spotted with Barack Obama on her pinky fingernail (left photo). And other likewise examples are seen on the hands of quite a few women. But wearing a ‘face on fingernail’ is actually just another example of nail art – which was already classified under the header: ‘bad fingernail trends’. • Fingernails ‘Faux Pas’ 5: Unkept Nails.